Your money really does make a difference to children’s lives. Maisha Foundation is currently funded entirely by voluntary contributions. 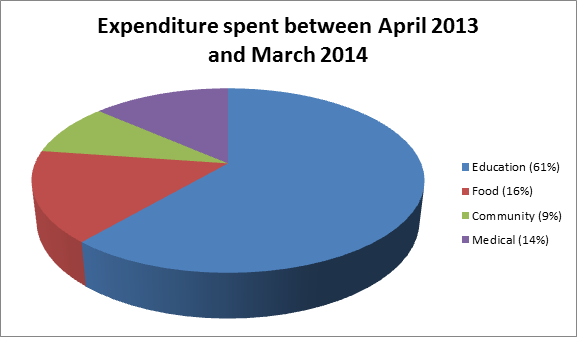 Find out how much income we raised between April 2013 to March 2014 and how we divided the costs between our three core elements of Community, Education and Food. The figures here relate to the activities of Maisha Foundation in the UK and in Kenya. 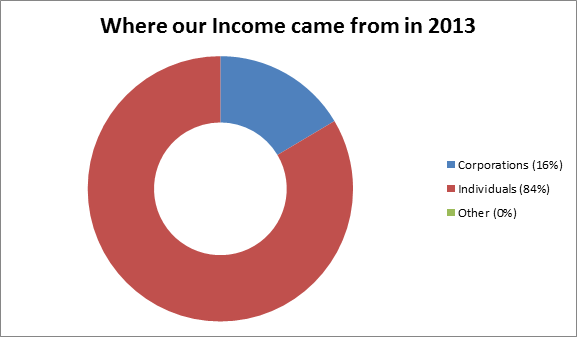 In 2013-14 our total income was £7,649, of which £1,260 was made from corporate donations and £6,389 from individual donors. In the same year, our total expenditure was £4,533, of which £2,778 was spent on Education Scholarships and Projects, £725 on our Feeding Programme, £613 on Medical Costs and £417 on our Community Craft Centre. Graphs below show these results clearly. The Board are currently working on the Trustees’ Annual Report which will also be published on the web site in due course.